Billy Flynn (Jon Voight) is an ex-boxing champion in the city of Hialeah, Florida, who is trying to settle down as a horse trainer after giving up his boxing title. A boxer propositions that Billy enter a match with him in the future. Billy shows up at the gym with his son Timothy Joseph "T.J." (Ricky Schroder), who calls his father "Champ" as a nickname. Billy is angered when he learns the man has not arrived and storms out of the gym, leaving his son behind. T.J. later finds him drunk inside of a bar. When he takes him home, neighbor Josie (Mary Jo Catlett) asks about his drunken state on the street, to which T.J. tells her that Charlie (Stefan Gierasch) and his friends bought him four beers as a celebration. The next morning, Billy announces that he won $6,400 gambling and uses it to buy T.J. his own horse named "Lady". Lady is entered in a race, but suddenly collapses, scraping her leg. Annie, (Faye Dunaway) Billy's wife whom he separated from seven years ago, had placed a bet on the horse beforehand and arrives after Lady's fall. Billy explains to Annie that he told T.J. she was dead, and that she deserted them. Billy, however, invites T.J. to her cruise ship where Annie and T.J. play together. Annie's current husband (Arthur Hill) confronts Billy to convince him to tell T.J. that Annie is his mother. Billy tells him that since she wasn't there for him, he has no mother. Billy loses a gamble on T.J.'s horse and is told by Whitey (Allan Miller) to either give him Lady or $2,000 in cash. Annie gives Billy the money, however, Whitey decides to take the horse instead. Billy responds by assaulting him and attacking anyone who tries to stop him, including a police officer. Billy is arrested and put into custody, where he tells T.J. that he is to live with Annie. T.J. refuses to leave, and Billy slaps him in a fit of rage. Dumbstruck, T.J. leaves. At her home, Annie tries to comfort T.J., but accidentally tells him she is indeed his mother. T.J. refuses to accept her as his mother due to her absence; Annie leaves the room, distraught. Billy is released; he hugs T.J. at a stadium and says he won't leave him ever again. Billy later wakes up in the middle of the night before Annie visits Billy and says she wants him to explain why she wasn't there for T.J., after a fight, Billy allows her back into his life as a friend. To make it up to his son, Billy explains his promise to fight in the ring after Jackie (Jack Warden) warns him about his age and constant headaches, explaining how they could be fatal when boxing. Jackie reluctantly agrees to train Billy to fight again. The night of the fight arrives. From his dressing room, T.J. sees that Billy's sparring opponent (Randall "Tex" Cobb) is much stronger than him, prompting worry. This is diverted, however, when they see Annie in the arena. Billy wins the first two rounds, but later receives many blows to the head, and is weakened. The doctor looks at Billy during break, then explains that if he gets worse the fight will have to stop. Billy continues to get badly hurt, but gets his second wind and wins by K.O. Billy faints as he's being taken back to his dressing room; he calls for T.J., then asks if he's happy that Billy won. T.J. confirms this, telling him "The Champ always comes through". Billy dies. T.J., who doesn't realize he is dead, yells at his father to wake up. He is told by Jackie that Billy is gone, and is distraught until Annie arrives. T.J. says goodbye to Billy, then enters an embrace in Annie's arms. Dana Elcar as Hoffmaster, an attorney. Ryan O'Neal signed to play the lead. However he wanted his son Griffin to play his co-star. The director refused, claiming Griffin was too old, so O'Neal pulled out of the film. The film received mixed reviews from critics and has a 40% rating on review aggregator website Rotten Tomatoes, based on 20 reviews and an average rating of 5/10. Michael Booth from The Denver Post spoke positively of the film: "Director Franco Zeffirelli makes beautiful pictures; from Shakespeare to the life of St. Francis. In “The Champ,” he imbues Florida with some oldtime movie magic, retelling the tale of a washed-up former boxer trying to shed booze and gambling to win back his son." Kevin Fiddler of the now defunct Henderson Home News praised the acting by briefly saying "Great performance from Jon Voight and Rick Schroeder." Time Out London was critical of the film, calling it "A pointless update of King Vidor's '30s weepie." Writing for The New York Times, Critic Vincent Canby intensely panned the film, stating that "the most offputting thing about such canny, tear-stained movies as The Champ is not their naïveté but their unholy sophistication. These movies don't mean to deal with the world as it really is, but as it should be." The film has also been called "the saddest movie in the world", and the final scene has been used in numerous psychology experiments to elicit a strong emotional response. According to Smithsonian magazine two psychologists, Robert Levenson and James Gross, conducted a study of more than 250 movie clips, and subjected them to 500 subjects in 1988, and concluded the last three minutes of the movie, where "T.J." sees his father win in his comeback fight only to witness his death in the dressing room afterwards, elicited the saddest response from a majority of the subjects. In the scene the grief-stricken "T.J." is inconsolable tugging his father's body while crying out "Champ, wake up. Please wake up, Champ." The film got off to a moderate start but retained holding and growing power and was MGM's biggest international hit in 14 years, grossing $30.4 million in the United States and Canada and over $17 million overseas, including more than $10 million in Japan. By September 1979, it was MGM's fourth biggest ever hit. Schroder won the Golden Globe Award for "Best New Male Star of the Year in a Motion Picture" at age nine for his performance as T.J. Flynn. Voight was a nominee for Best Actor but lost out to Dustin Hoffman for his role in Kramer vs. Kramer. Dave Grusin's score was nominated for an Oscar at the 52nd Academy Awards. ^ a b Pollock, Dale (September 19, 1979). "[?] MGM Int'l Film in 14 Yrs". Daily Variety. p. 1. ^ Booth, Michael (March 26, 2007). "Tearjerker with sweet lessons". The Denver Post. Retrieved 2018-05-05. ^ Vincent Canby (April 4, 1979). 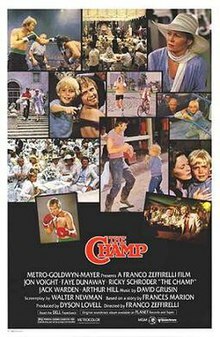 "Film: Zeffirelli's 'The Champ':A Return Match". The New York Times. Retrieved 2010-12-20. ^ Chin, Richard (July 21, 2011). "The Saddest Movie in the World". Smithsonian. ^ Gross, James L.; Levenson, Robert W. (1995). "Emotion Elicitation Using Films" (PDF). Cognition & Emotion. 9 (1): 87–108. doi:10.1080/02699939508408966. ^ "The Champ, Box Office Information". Box Office Mojo. Retrieved June 6, 2013. The Doctors TV Show featured a segment called Film Therapy in which Aaron Webster describes "The Champ" (1979) with stills from the movie. Produced by Daniel Primer. CBS. The Film Therapy link is available online at The Doctors TV website.